From the famous ace by Tiger Woods, to Phil's first win to the now-outlawed caddy races. SCOTTSDALE, Ariz. - The Greatest Show on Grass or Greenest Show on Grass or the biggest party in golf tees off in less than three weeks now and its time to get you excited by looking back on the good times. There's a reason the Phoenix Open is on the "Mount Rushmore" of golf events for some people along with major tournaments like the Masters and British Open. It has to do with both the atmosphere and the rich history of the tournament. With that said, let's look through some of the most memorable moments in tournament history. It was the birth of one of the greatest rivalries and friendships in the history of the sport. 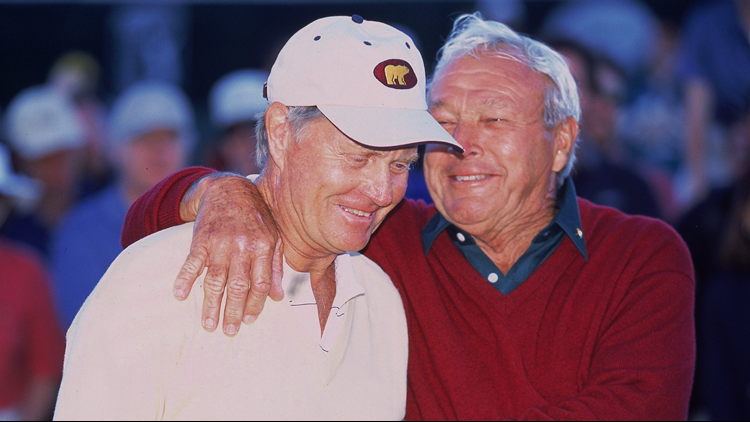 Jack Nicklaus had just turned professional in 1961 and then at the Phoenix Open, he was paired with Arnold Palmer for the first time, who was already a household name on tour with four major victories in the previous three years. The two were paired in the final round as Palmer coasted to a 12-shot victory and Nicklaus finished T-2. The roles were reversed later that year when Nicklaus got his first major victory at the 1962 U.S. Open, beating Palmer in a playoff. The rest is history. Johnny Miller was so good in the mid-70s, there really was nobody better in the game during this time. After winning the 1973 U.S. Open, Miller won an additional 15 times between 1974 and 1976. Miller had 25 career PGA Tour wins and eight of those came at desert courses, including two in Phoenix. 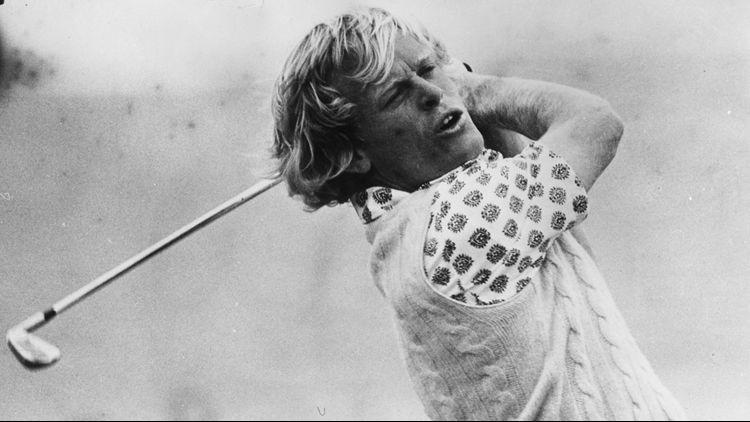 At Phoenix Country Club in 1975, Johnny Miller was dominant. He won by a whopping 14 strokes over Jerry Heard and still holds the record for largest margin of victory at the event to this day. The next week, Miller won the Tucson Open by nine strokes. What if I told you, there's only been one hole-in-one on a par 4 ever in Tour history and there's no video of the ball actually going in the hole? 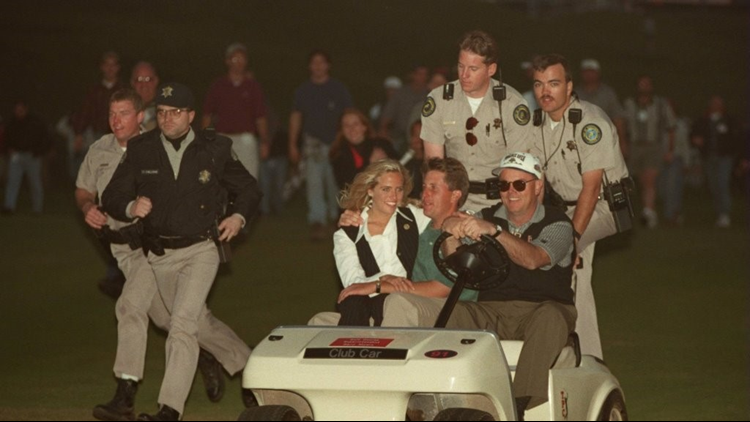 It's not that dramatic, it happened, at the Phoenix Open in 2001. The 17th hole was playing 332 yards and Andrew Magee stood on the tee box thinking he couldn't get it to the green. So, he didn't bother waiting for the group in front to clear the green. The ball hopped onto the green, deflected off Tom Byrum's putter and went right in the hole. It can be argued that Magee's shot is the most bizarre, unique shot and outcome in PGA Tour history. And of course, it happened at the Phoenix Open. To this day, it's the only ever par 4 hole-in-one in an official PGA Tour event. Aaron Baddely hit it in from the tee box on a par 4 in 2015, but it was his third shot after going out of bounds on his first drive attempt, so it was only a birdie. 31 Jan 1999: Tiger Woods watches as fans move the boulder out of the way during the Phoenix Open at the TPC of Scottsdale in Scottsdale, Arizona. *Shouts*: Decision 23-1/3!!! The golf rule that became famous on Jan. 24, 1999. 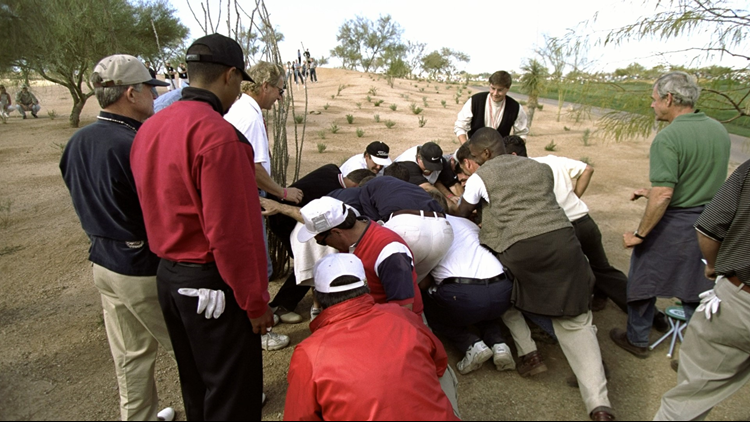 When Tiger Woods hit a shot that ended up in the rough (desert) right behind a large boulder, he called on the gallery for what would become one of the most iconic moments in Phoenix Open and golf fan history. Tiger thanked the fans who helped move the boulder after he was able to get a clear shot. It's unclear how many patrons suffered back injuries after that but I'd set the over/under at five, maybe six. Nobody (other than maybe Tiger) gets as much fan support at the Phoenix Open as Phil Mickelson. 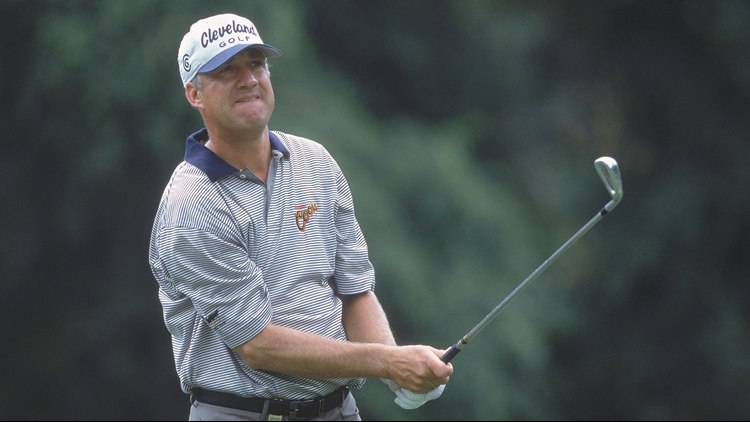 The Arizona State star burst on the PGA Tour scene in 1991, grabbing his first win as an amateur. He came into the 1996 season with five wins, but none yet at the Phoenix Open. 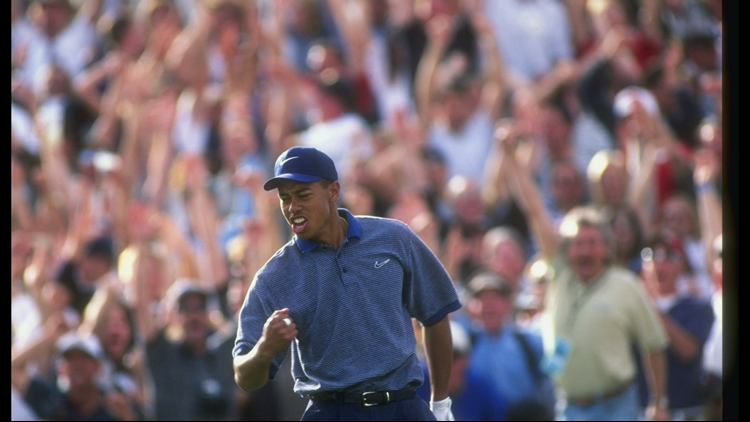 That all changed in 1996 when Phil tied Justin Leonard after 72 holes, sending the match into a playoff. Mickelson won the third playoff hole with a birdie and the crowd went absolutely bonkers. He also got a pretty legendary photo (above) out of it. One thing we can all (hopefully) agree on is that when the Tour banned caddy races it was a sad, sad day in the history of the sport. Except for maybe you traditionalist curmudgeons. The caddy races that took place on the 16th hole were one of the most enjoyable parts of the event for fans for a few years there, but sadly all we have is the memories. And videos. Enjoy. This is one of the most well-known, most exciting golf shots in the history of the sport. It's not just that Tiger Woods hits a hole in one, but it's where he does it. Number 16 at TPC Scottsdale. Two hops. In the hole. Electric. Eldrick. With that, the biggest party in golf was given new meaning. Anytime I want to start cutting down on coffee, I just watch this video to give me energy. I'd be remiss if I didn't include some other hole in ones made at the Phoenix Open. Jan. 31 can not come soon enough.